The West coast of Canada is something else. It’s what you picture of then you think of Canada: mountains, wildlife, trees, ocean. Truly majestic. Vancouver is such a wonderful collaboration between city life, and nature; with the mountains and epic hikes a stone’s throw away, and yet all the conveniences of modern life (organic cafés and stores, gyms, and holistic healing tools- from saunas and cryo, to ayurvedic doctors) within arms reach as well. May this guide inspire you to discover the magic of Vancouver! YEW Seafood + Bar: for local, sustainable seafood (and an interactive kitchen!) downtown Vancouver. Salmon gravlax with cucumber, avocado, toasted sesame + tamarind sauce at Yew. Freshly shucked oysters at West. Café by Tao: organic health store and veggie café run by mother and daughter in North Van. This place is legit; all organic, no BS. They sell juices, soups, sandwiches, wraps, lots of raw goods, cakes, chocolates, and raw desserts. The shop is full of herbs, tinctures, natural salve and balms, and even colloidal silver. Closed on Monday. Tama Organic Life: serving vegan Japanese inspired meals bento box, onigiri, wraps, sandwiches, smoothies. Aphrodite’s Organic Café & Pie Shop: Laid-back choice for organic, farm-to-table eats, juice bar, desserts including vegan & gluten-free options. Shizen Ya: Japanese with organic brown rice, organic greens, no MSG, no additives. The Green Moustache: organic vegan eatery with cold pressed juices, raw cakes, smoothies, soups, and the sorts. Multiple locations. Buddha-Full: Another typical healthy vegan café, full of nut mylk turmeric lattes, juices, smoothies, bliss balls, and buddha bowls. Multiple locations. Eternal Abundance: all organic vegan grocery store and café. Caveman Cafe feast platter, with organic smoked chicken, wils salmon, and organic greens. Steak and mushrooms, and a burger on lettuce bun at Two Rivers. Caveman Cafe (Gastown): Super paleo spot, serving simple meals full of organic, grass-fed meats and wild fish, organic veggies. Everything is cooked in olive or avocado oil. No Additives, MSG, Sugar or Preservatives. Not spectacular looking feeds, but super nutritious! The Naam: voted Vancouver’s best vegetarian restaurant multiple years running, this organic gem is definitely a must-eat. They also have live local music Sunday to Thursday, from 7-10 pm. Two River Meats: Butcher that has a dine-in option (burgers, steaks, sausages on the grill). Delicious, simple feeds. 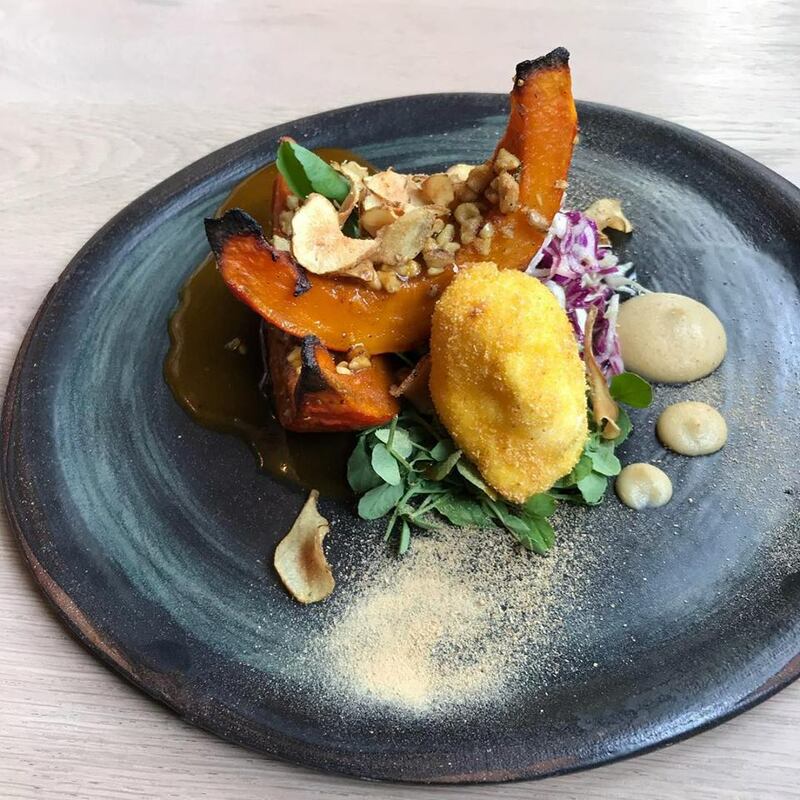 The Acorn: creative vegetarian meals made from fresh, locally sourced ingredients. #1 greens juice, from Glory Juice Co. Glory Juice Co.: organic juice/ smoothie bar with multiple locations. 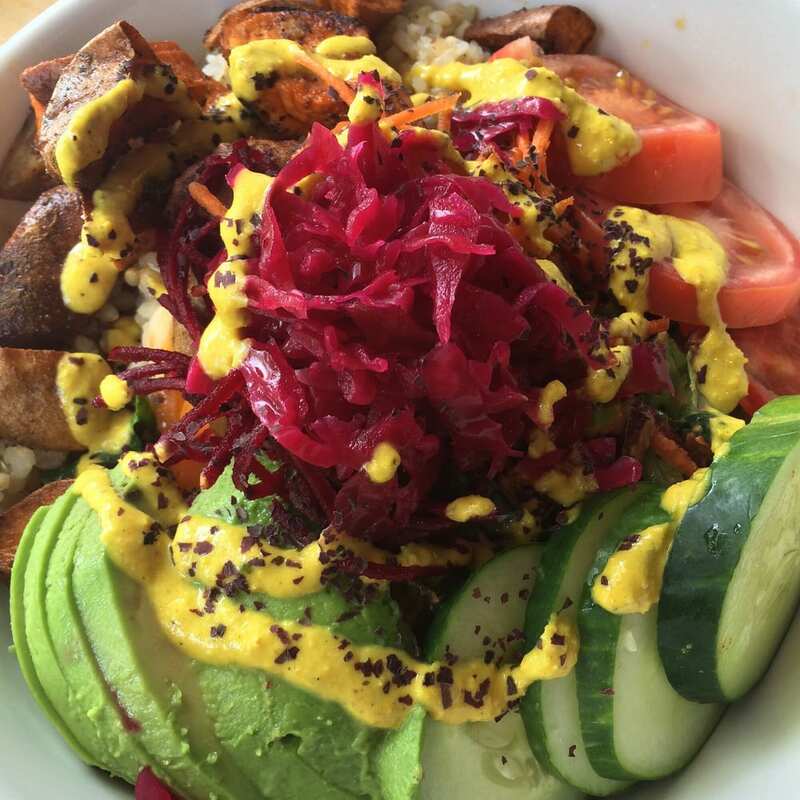 They also serve smoothie bowls, warm veggie bowls, balls, and super-food shots. Active Body Nutrition: in West Van, this spot is #legitAF. They sell smoothies, organic cold pressed juices, and a tonne of superfoods and health products. There are incredible boosters like local pine pollen, E3 Live, and more. A must-do if you’re in the area! Living Produce Aisle: smoothies, salads, and microgreen specialists. This place is pretty damn neat: they grow a plethora of microgreens on site. Located in Yaletown. Kitsilano Farmers Market: 2690 Larch St (W 10th Ave), Vancouver, BC. Sunday 10am-2pm. Trout Lake Farmers Market: 3350 Victoria Dr. (at John Hendry Park), Vancouver, BC. Saturdays 9am - 2pm May through mid October. Hastings Park Winter Farmers Market: Sundays 10am - 2pm; November through April (except Dec 30) @ Hastings Park - Centre grounds. Downtown Farmers Market: Thursdays 3pm - 7pm June through October @688 Hamilton St. at Georgia St.
Mount Pleasant Farmers Market: Sundays 10am - 2pm May through October @Dude Chilling Park. Granville Island Public Markets: 1669 Johnston St, Vancouver. 7 days a week 9am-7pm. Quite the classic Vancouver experience; these markets stock everything you need to cook up a feast, plus there’s loads of fun things to see while you’re there. Don’t miss the epic pickles (Jalapeno is killer), and all the fresh seafood! Pasture to Plate: apart from their amazing café, you can also stock up on meat! Meat sauces, soups, stews, as well as cuts of beef, lamb, pork, sausages, whole chickens, organ meat, and bones. Their Commercial Drive location is a full functioning butcher, and their Denman location (the café) has a large freezer full of any cut you may need. You can also get incredible pickles, and things like collagen, some cured meats, and a few more goodies. Home On The Range Organics: is an organic grocer/ butcher that stocks some amazing products including bone broth, and meats including all your usual grass-fed beef, lamb, organic chicken, as well as wild game, as well as goose, ostrich, and kangaroo. They sell cheese, have a bakery, and seafood too. Two River Meats: Your typical butcher meat: chicken, beef, lamb. Only their lamb sausages are made without any added sugars; all their cured meats contain a dextrose. Greens Organic and Natural Market: fresh produce, local and organic meat and seafood, and packaged goods. Greens Organic and Natural Market. Aphrodite’s Organic Café & Pie Shop: has a “market” section, with shelves that feature local products from their favourite organic producers that are also featured ingredients on their restaurant menu, including farm fresh SPCA certified eggs from Rehoboth Farm, artisan cheeses from Golden Ears Cheesecrafters, local organic hand-crafted teas from Namasthe Tea, farm honey, our housemade pesto, vegan granola, and salad dressings. Active Body Nutrition: apart from being a smoothie/ juice bar, these guys have some killer products in the shop. I’m taking #nextlevel stuff, from medicinal herbs and tinctures, collagen, hemp oils and seeds, snack bars, protein powders, and more. Famous Foods: “Vancouver’s original natural and bulk food store”. West Wood Organics: awesome little organic health store in Kerrisdale. Tao Organics: organic health store and café run by mother and daughter. This place is legit; all organic, no BS. The shop is full of herbs, tinctures, natural salve and balms, and even colloidal silver. Closed on Monday. 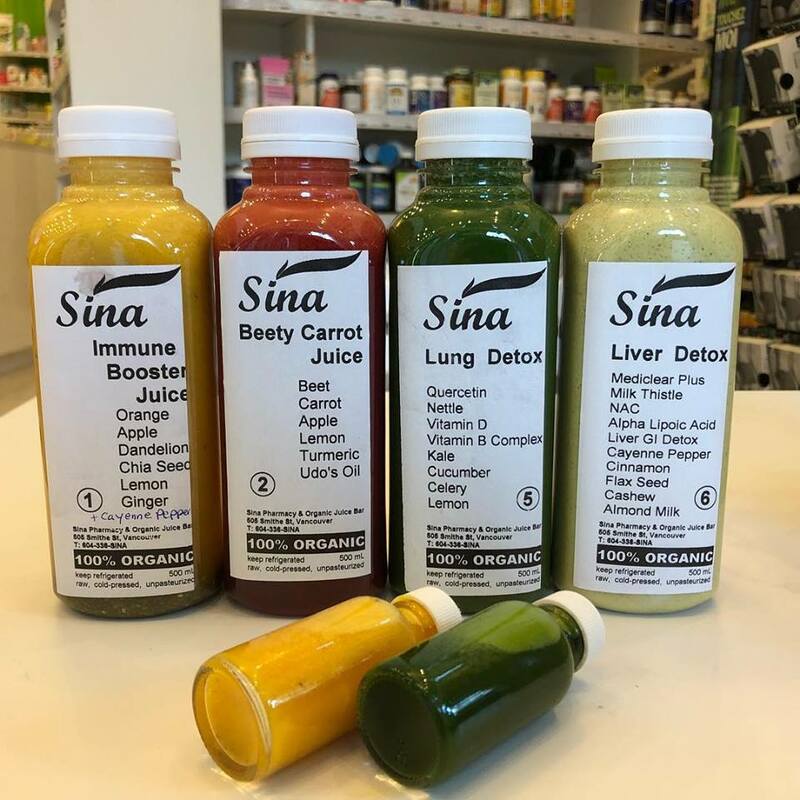 Sina pharmacy and juice bar. Sina Pharmacy & Health Centre: natural pharmacy, organic juice bar, and organic to-go meals. This place is not your average pharmacy! Victoria's Health & Organic Bar: two locations (one North Shore and a newer location downtown) for all your health-supply needs. The Garden Health Foods: the store is small, but the employees who know what’s up when it comes to making recommendations. Greens Organic & Natural Market: One of Vancouver’s first grocery stores to take on the zero waste challenge. They buy local, compost, recycle, all the good stuff. Wholefoods (multiple locations): Wholefoods is the same anywhere you go in the world. Not the best, but not the worst… reliable for organic stuff, and recognisable brand names. Kitsilano beach - most popular beach in the area, Kits has grass for sunbathing, several volleyball courts, a pool (Vancouver’s only saltwater swimming pool). Wreck Beach: stretches almost 8kms, and is North America’s largest nudist (clothing optional) beach. Second Beach: one of many beach’s around Stanley Park, near downtown Vancouver, located along the seawall. Has an outdoor heated pool, bbq’s, a park, and more. English Bay Beach: aka First Beach is the most famous and visited beach in Vancouver’s downtown area, right off Denman Street. Home to the New Year’s Day Polar Bear dip! Jericho beach- west of Kitsilano beach, Jericho is a famous sailing and windsurfing beach, that also has recreational activity areas including soccer, volleyball, tennis, and baseball. Ambleside beach- West Van dog-friendly beach with unbeatable views of Stanley Park and the Lions Gate Bridge. Views from Ambleside beach, West Van. Stawamus Chief (Squamish, 45 min drive from Vancouver): is a must-do hike for any hiking enthusiasts! There are 3 peaks, all boasting incredible views. The hike is super fun, and includes a few ladders, some chains, and a whole lot of magic. The peaks are really special, long and flat. You can camp at the base of Chief as well. Sea to Sky Gondola: located on Highway 99 just south of Squamish, this 10 minute gondola ride will take you up to some epic views, and plenty of activities, including hikes, walks, a suspension bridge, cafés, and other activities. Hiking in the rain, at Norvan. Lions Head: (1 hour drive from Vancouver) - 16 km hike (full day 8 hour hike), gorgeous views. About 1280 meters elevation. Grouse Mountain (The Grouse Grind): There are multiple trails on Grouse (which turns into a ski hill in the winter)- but the Grind is a classic Vancouver hike. Also known as nature’s stairmaster, you’re essentially climbing vertical (stairs) the entire time. Try for under 60 minutes if your a badass! Great views from the top, and you can hop on the gondola back down to the parking lot (for $15). Quarry Rock: (North Shore, Deep Cove) Easy hike in North Van, about 4 km round trip (1.5 hours). Norvan Falls: 40 min drive from Vancouver, these North Shore falls are a gorgeous hike.14 km round trip, about a 5 hour hike (there are shorter options too in the area of Lynn Headwaters Regional Park). Capilano Bridge Park: is the Disneyland of suspension bridges. Seriously, skip it if you can help yourself. It’s neat if you have kids (they have a tree-top walk), but it’s so full of people trying to take instagram selfies that you may actually consider jumping off the bridge to escape it. The better option is Lynn Canyon suspension bridge/ trails (see below). Capilano tree top walk (don’t be fooled, it won’t be deserted unless you literally break in when the park is closed). Lynn Canyon / Lynn Canyon Suspension Bridge: (North Shore) This park is easily accessible by car and by bus, in North Vancouver. There are multiple trails, as well as a gorgeous suspension bridge. Unlike Capilano suspension bridge, this one isn’t a built up tourist attraction- so there are way less people, and it’s just generally a nicer vibe. Cold plunging in the Lynn Canyon 30 ft plunge pool, November 2018. Lynn Canyon 30 ft plunge pool: (North Shore) Along the trail past the suspension bridge (you turn a sharp left at the end of the bridge) you’ll eventually reach the 30ft plunge pool! It’s on the left, just at the base of the stairs. In the summer, you’ll find people swimming, and in the fall/ winter you may see a lunatic (aka me!) cold plunging. Mystery Lake: located on Mount Seymour, this hidden lake is truly a must-see gem of Vancouver. To access it you drive all the way up Mt Seymour to the ski hill parking lot, and then there are two ways to access the lake, either by going to the very end of the parking lot and hiking up the ski hills by the main chair lift, crossing under the large lift, and then up two more hills OR following the more leisure path that starts to the right of the parking lot, just past the bathrooms (in the main parking lot). This is a popular summer swim spot, and also an excellent place to cold plunge in the late fall. Me! Cold plunging in Mystery Lake (Mt. Seymour), November 2018. Sunset from Lighthouse Park, West Van. Stanley Park: world renowned urban park and tourist attraction featuring a 8.8km sea wall overlooking English bay. 27 km of trails winding throughout the park. There’s food, beaches, and plenty to do. Dr. Sun Yat-Sen Classical Chinese Garden: named the World’s Top City Garden by National Geographic, nuff said! Perimeter Loop at Mundy Park: 176-hectare park in Coquitlam, with a four-kilometer path called the perimeter loop, perfect for running or cycling. Buntzen Lake Trail: an 8 km trail maintained by BC hydro that runs the perimeter of Vancouver, around the gorgeous Buntzen lake. Lighthouse Park in West Vancouver: up to 6 km of gentle walking along the water, with beautiful lighthouse. Pacific Spirit Regional Park: on the edge of the University of British Columbia’s campus. Prince of Whales Whale Watching: they have a tour for all your whale watching dreams. Big boats, small boats, in the day or during sunset. Groups, charters, and custom events. 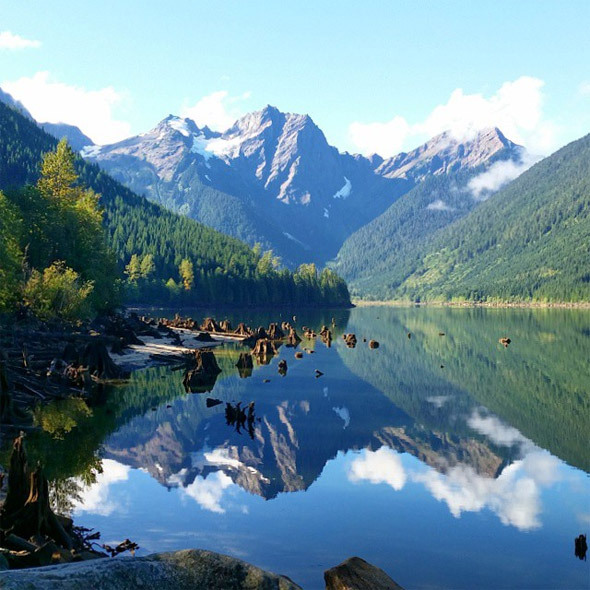 Jones Lake (Chilliwack): gorgeous lake about 2 hours from Vancouver, epic place to go camping. Joffre Lake Provincial Park (Pemberton): Crystal blue waters reminiscent of Lake Louise in Banff. About 2.5-3 hour drive from Vancouver, but totally worth it. Plenty of hiking trails (and camping) too! Keyhole hot springs, Pemberton, BC. Lussier Hot Springs: Whiteswan Lake Provincial Park. Undeveloped and gorgeous, with a cold creek nearby for hot/cold therapy. Hot Springs Cove: located on Vancouver island, off of Tofino. These are a must-do if you can make it happen; they require booking a tour boat (unaccessible otherwise), but a short hike from the boat drop-off will get you to these magical (undeveloped) hot springs, and you can hop in and out from the springs to the ocean…. Bliss! Harrison Hot Springs: I’m including these only to give you a heads up that THEY ARE CHLORINATED! Like, wtf! The Harrison Hot Springs (surrounded by the hotel) are only 1.5 hours from Vancouver, but are filtered and chlorinated… abort mission!! 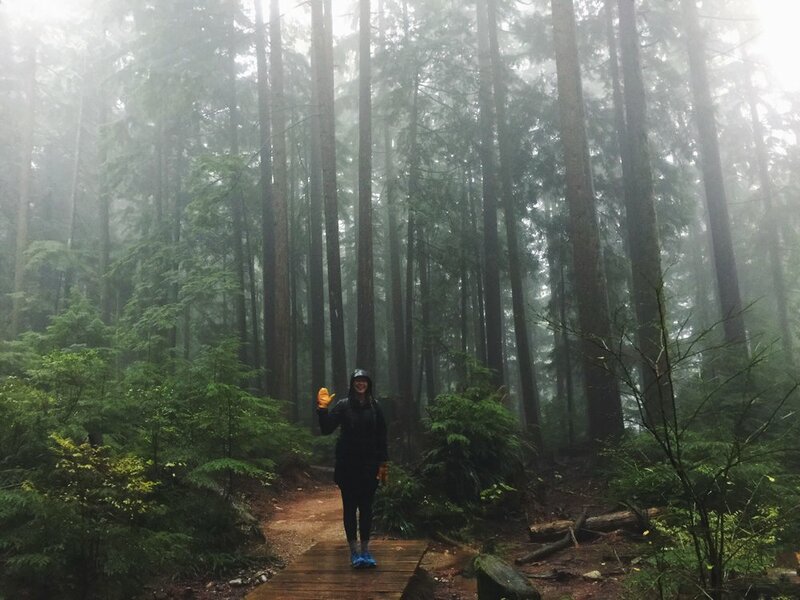 The Grouse Grind: for the ultimate nature’s stairmaster experience! Bicycle or run through Stanley Park along the seawall: a must-do when you’re in Vancouver, this seawall is packed with fitness-enthusiasts, with plenty of benches and spots to stop and take-in a little sunshine along the way. Trail running at Cleveland Dam: they even have a yearly knee knacker team run. Spirit Trail: the North Shore Spirit Trail is a scenic waterfront trail that extends from Horseshoe Bay all the way to Deep Cove. It’s a great bicycle ride, and you can even connect to the Lions Gate bridge, and ride over to connect to the seawall, and ride into downtown Vancouver. Deep Cove Kayak: around False Creek for a different view of the city or take a tour up Indian Arm: more peaceful/ beautiful ride. Either way, killer upper body workout! Lessons, tours, and rentals available. Vancouver Water Adventures rent SUPs at $30 for two hours. Other companies include Windsure, Ecomarine, and WazSUP. Stand Up Paddle Vancouver: SUP Yoga/ Acroyoga at multiple locations. Dragon Boat in Deep Cove: for people of all levels, brought to you by the Deep Cove Kayak company. Mountain biking in Whistler: some of the most famous trails in the world. Equinox Fitness- West Georgia St. downtown. Equinox gyms are worth the investment if you value a gym; the classes are independent studio quality, and the change rooms include perks like organic tampons (so much yes). 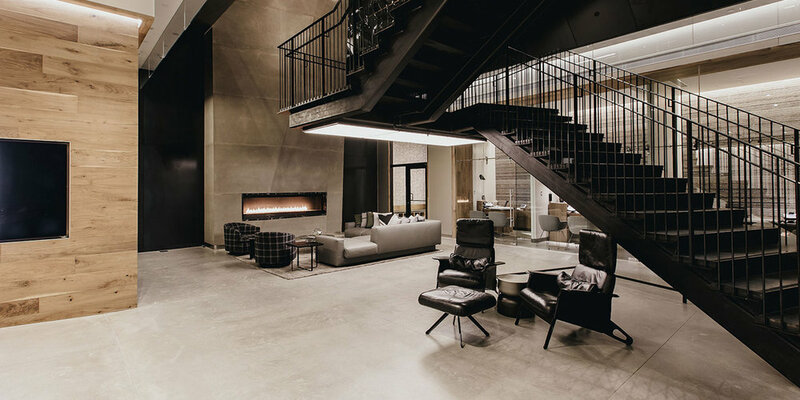 There’s a sauna, a steam room, reformer pilates, boxing, a hot yoga studio, a juice bar, and the facility is super central downtown Van. Hive bouldering and yoga gym: This place is rad; for all level climbers (lesson available), you can climb and yoga (+ meditation classes) with your membership. First timers get a 21$ day pass, and from there you can drop-in, get a 10 pass card, or grab an unlimited membership. Their newest location is on the north shore, but they have a downtown gym as well. Cliffhanger rock climbing gym: downtown Vancouver, for all levels. Rental equipment available. Barre Fitness: multiple locations across Vancouver area, they also have a 2 weeks for 40$ intro. Tantra Fitness: let your inner stripper reign free, with pole fitness. Dynasty Gym: very cool facility, downtown Van. They offer open gym, crossfit, olympic weightlifting, stretch class, and more. Drop in rates are $25, memberships are 3 month minimum. Free trial available. Modo Yoga: (formally Moksha Yoga) is my favourite hot yoga studio. Their intro month is $60, and also have community (karma) classes available by donation. Just Yoga: limits the number of yogis per studio, so no packed like a can of sardines classes! They offer a free intro class. Ashtanga Yoga Vancouver: for the ashtangi’s. YYoga: multiple classes throughout the day, and studios across the city. Lululemon: with it’s roots in Vancouver, Lulu is always a great place for free fitness (especially yoga) classes. check their schedule to see when and where. Walking around (or renting a bicycle) is a great way to get movement in, but also see some of the regular sights. Here are some of the top sights/ areas to see in the Vancouver area. Gastown: Vancouver’s oldest hood, beautiful Victorian architecture. Yaletown: another classic Vancouver hood, full of trendy shops and cafés. Granville island: is a super-touristy spot, but worth the visit. You can get there by car (over the big bridge), loop around on a bicycle, or take the cute little ferry from directly across (under the bridge). There’s plenty of shops, an organic coffee roaster, an organic bakery, a neat natural threads shop, and a large food market. Lions Gate Bridge: Connects downtown to the North Shore, and boasts gorgeous views along the way. A bicycle lane on both sides of the bridge makes for a great way to cross over (and a pit-stop midway to take in the scenery). The Seabus: runs between downtown Vancouver and North Vancouver, and is actually connected to the bus system. It’s definitely worth taking, not only because of how quick and easy it is a trip between downtown and the North, but it’s also a pleasant view of the city. Vancouver Art Gallery: it can get pretty rainy in Vancouver… take shelter and get cultured at the same time. The Good Spirit: is a metaphysical supply store, for all your metaphysical supply needs! Tarot cards, sage, crystals.. you know the deal. Utopia: is your metaphysical go-to for the North Shore. Whether you want to breath in some incense or flip through Be Here Now, Utopia has got you covered. CHI, The Spa (in the Shangri-La Hotel Vancouver): holistic approach to massages and treatments, drawing on authentic natural healing methods found in the restorative riches of Asia’s traditional well-being practices. They offer a whole menu of treatments inspired by B.C. indigenous traditions as part of their Sense of Place program. The Sea Therapy Facial uses Canadian seaweed! Rosewood Hotel Georgia Sense spa: signature services and experiences inspired by British Columbia such as the Tides Body Treatment, Canadian Maple Pedicure and Georgian Revival Massage. Vida Spa: Ayurvedic spa that offers full 60, 90 or 120 minute services vs. 50 and 80 minutes of regular spas… HELL YES TO THAT! Massages, facials, body wraps, and a plethora of ayurvedic treatments, as well as 3 and 5 day cleanses. Multiple locations across BC. Northview Health: $20 per drop-in infrared sauna session (45 mins), call to book ahead. They also have massage therapy and other services available. Hastings Steam & Sauna: private and public steam baths and sauna. Float House (multiple locations): $39 - $75/ float tank session, and floating memberships available. Moment Meditation: a sanctuary in the middle of downtown Vancouver! This meditation members club is devoted to supporting the community find more calm, focus, and happiness. Boom. Therapy Health Studio: a self care sanctuary tucked inside mount pleasant’s historic lee building; services include contemporary natural health, RMT, Rolf Method of Structural Integration, and counselling. Honey + Garlic Health Studio: RMT, physio, acupuncture, chiro, and registered dietician. True Health Studio: chiro, acupuncture, RMT. Naturopath: Dr. Saeid Mushtagh, at the Northshore Naturopathic Clinic. Saeid is a Jedi when it comes to natural medicine. I connected with him through the grapevine via a mutual friend, and have worked with him personally. Whether you’re looking to fix an imbalance or strive for health preventatively, I highly recommend connecting with him. View of the North shore from the waterfront trail, downtown Vancouver.